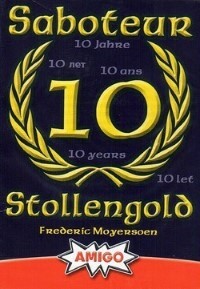 Saboteur: Rock Gold is an expansion for the Saboteur 10 Years Anniversary. The three Rock Gold cards can be used with Saboteur and Saboteur2. These cards allow the players to win extra Gold points. At the start of each round, after distributing the Miner cards, the player at the right of the Start player choses and places one Rock gold card on any empty spot between the Start card and the Destination cards (but not adjacent to one of these cards). The card remains on that spot till the end of the round. 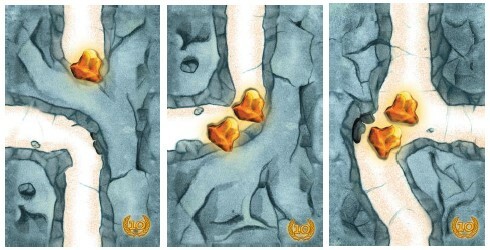 The first player who manages to establish an uninterrupted path from the Start card to the Rock Gold card, gets the Gold points which are displayed on the card. He/she takes the corresponding Gold point card (Saboteur) or token (Saboteur 2) and places it visible in front of him/her. He/she quits the actual round either immediately after establishing the connection, either at the start of any subsequent round. When quitting the round, the Gold card or token is flipped facedown. The role card, however, remains secret till the end of the round. The player may not play any card during the actual round anymore and doesn't participate in the distribution of the Gold at the end of the round. He/she continues playing the round till the end and participates in the distribution of the Gold with the winning team. In this case, the player gets his share above the Rock gold points which were acquired already. In case that the player continues playing the round till the end, but belongs to the losing team, he/she gets no gold at all and must discard the gold points which were acquired by connecting the Rock card. The card or token is put back in the reserve. Cave-in: The "Cave-in" Action card may not be played on a Rock Gold card. Ladder card (Saboteur2): A ladder card may not be placed immediately adjacent to a Rock Gold card.